Microsoft Word file format only is acceptable for the main manuscript document. All text in manuscripts should be in 12-point Times New Roman font, double-spaced, justified-alignment only. Maximum page limit is 20 pages including the references, tables, appendices. Only JPEG (JPG) or TIFF (TIF) file format for illustrations and figures is accepted for photographs or images. Abstract: Should not exceed 300 words. Main Text starting with an Introduction. Authors should not number the headings and subheadings starting from Introduction to Conclusion. Manuscripts should be prepared double-spaced in Microsoft Word, with pages numbered consecutively, using Times New Roman font at 12 points. The volume of the manuscript (references, summaries, illustrations, and tables) is preferably no more than 20 double-spaced pages. It is essential that the paper be written in clear, proper English. Manuscripts requiring substantial improvement of English usage may be returned to the author(s) for revision before the review process. If English is not your native language, we recommend that you ask a native English speaker to read over your manuscript before submitting. The authors should consult a recent issue of the journal for style (see Template of Final Paper). The editors reserve the right to adjust style to certain standards of uniformity. Authors should submit articles in Microsoft Word through the ONLINE MANUSCRIPT SUBMISSION CENTRE. It is a condition of publication that authors grant an exclusive license to Ideal True Scholar. This ensures that requests from third parties to reproduce articles are handled efficiently and consistently, and will allow the article to be as widely disseminated as possible. 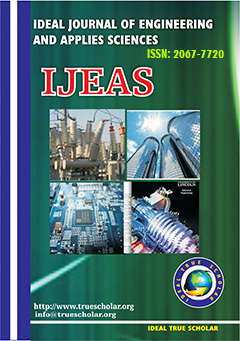 In assigning copyright, authors may use their own material in other publications, provided that the journal is acknowledged as the original place of publication, and Ideal True Scholar Journals is notified in writing and in advance. The Title should be concise but informative. The arrangement of words is important for indexing purposes. A short running title should be provided. The name(s), including one forename in full, affiliation(s), full address(es), and e-mail address(es) of the author(s) should follow the title of the paper. In the covering letter the corresponding author and his/her telephone and fax numbers should be indicated. The Abstract should be a self-contained summary of the paper, presenting concisely the objectives of the work reported, methodology, results, and conclusions. It consists of no more than 200 words in one paragraph. The Keyword should have a minimum of five and maximum of seven words. Introduction should be a review of pertinent work, should cite appropriate references, and should also include a clear statement of the object of investigation. Materials and Methods should include the methods and methodology the research was carried out. A clear description or specific original reference is required for all analytical and statistical procedures and a statement of the results of the statistical analysis should justify the interpretations and conclusions. Results are presented in the form of tables or figures when feasible and the text should explain or elaborate on the tabular data, but numbers should not be repeated within the text. Sufficient data, all with some index of variation attached, should be presented to allow the reader to interpret the results of the experiment. Discussion should interpret the results clearly and concisely in terms of mechanisms and significance and also should integrate the research findings with the body of previously published literature to provide the reader with a broad base on which to accept or reject the hypotheses tested. Focused on the interpretation of the results rather then a repetition of the results section. Conclusion is where you summarize the paper’s findings and generalize their importance, discuss ambiguous data, and recommend further research. An effective conclusion should provide closure for a paper, leaving the reader feeling satisfied that the concepts have been fully explained. or not. Usually, the acknowledgments section includes the names of people who in some way contributed to the work, but do not fit the criteria to be listed as the authors. This section of your manuscript can also include information about funding sources. Special characters (e.g., Greek and symbols) should be inserted using the symbols palette available in this font. Complex equations should be entered using Math-Type or an equation editor. Tables and figures can be placed in the text. The final quality of your illustrations as they appear in the journal, depends on the quality with which you send them to us. If poor resolutions figures are sent, poor quality images are reproduced. As a general, manipulate images as little as possible, so as to avoid losing resolution, and always accompany your submission with original format of the file before exporting to other formats such as JPG, JPEG, EPS (for photograph and screen dumps) PDF (for line drawings). Illustrations should be prepared in their final format (that is no enlarging or reducing will be necessary) and to fit into the print area of the journal (127 mm × 200 mm). All illustrations must be clearly numbered and provided with the title and the name(s) of the author(s). The appropriate place for each illustration in the text should be indicated in the margin. If necessary, the top of the figure should be indicated. All illustrations must have self-explanatory legends. The captions to illustrations should be listed separately. Dense shading for background should be avoided. The lettering (upper- and lowercase letters, italic, bold) should follow the usage in the text. Different parts of a figure should be marked by lowercase letters in parentheses. The size of symbols and lettering should not be smaller than 1.5 mm. Make sure that any artwork is at the appropriate, minimum, resolution: 300 dpi for halftones and greyscale, 600 dpi for combinations (line art and halftones together), and 600 dpi for line art. Colour illustrations are accepted if they are essential to the presentation. The images should be in CMYK mode (resolution at least 300 dpi). Authors will be asked to cover the full cost incurred in colour printing. Further information concerning colour illustrations can be obtained from the Executive Editor. Papers accepted become the copyright of the Ideal True Scholar Journal. Upon acceptance of an article, the author(s) will be asked to sign a Copyright Transfer Agreement (see Copyright Transfer Agreement Form). Authors are responsible for obtaining, from the copyright holder, written permission to reproduce previously published (copyrighted) illustrations or tables. The authors and their employers retain full rights to reuse their material for their own purposes, with acknowledgement of its original publication in the journal. Permissions to use reprinted material, adapted material, and material owned by other parties are the sole responsibility of the authors. Author(s) should follow the latest edition of APA style in referencing. Please visit www.apastyle.org to learn more about APA style. Examples of reference style are shown below. Please take care to follow the reference style precisely. Miller-Rushing, A. J., Primack, R. B., Primack, D., & Mukunda, S. (2006). Photographs and herbarium specimens as tools to document phonological changes in response to global warming. American Journal of Botany, 93, 1667-1674. Brunero, S., Cowan, D., & Fairbrother, G. (2008). Reducing emotional distress in nurses using cognitive behavioral therapy: A preliminary program evaluation. Journal of Nursing Science, 5(2), 109-115. Nguyen, C. A. (2012). Humor and deception in advertising: When laughter may not be the best medicine. Paper presented at the meeting of the American Psychological Association, Orlando, FL. Gore, A. (2006). An inconvenient truth: The planetary emergency of global warming and what we can do about it. Emmaus, PA: Rodale. Daniels, P. J. (1993). Australia’s foreign debt: Searching for the benefits. In P. Maxwell & S. Hopkins (Eds. ), Macroeconomics: Contemporary Australian readings (pp. 200-250). Pymble, Australia: Harper Educational. Carlson, W. R. (1977). Dialectic and rhetoric in Pierre Bayle. (Unpublished doctoral dissertation). Yale University, USA. The submission file is in Microsoft Word or RTF file format. Manuscript preparation guideline suggested by the journal has been followed. The guideline specifies many issues including maximum size, format of the article and style of referencing. The submission file does not have author’s information to ensure blinded review. Once accepted, author(s) will be required to pay the publication fee to facilitate open-access publication.